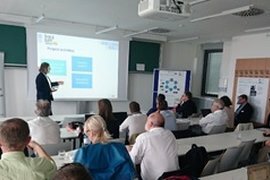 Our partners presented the Dem4BIPV courses in the dedicated session 'Education material for BIPV professionals and students' of the workshop „BIPV as Architectural Tool” in Vienna on 15 June 2018. The workshop was organized in co-operation with the Austrian Photovoltaics Technology Platform (TPPV). This succesful event was an opportunity to meet local PV-Architects and BIPV Stakeholders and to exchange experiences on the topic.